Ato Professional AEQ231 Stereo 31- Band Graphic EQWith AEQ231 you get precise and reliable sound-shaping control. It’s built to last and perfect for any pro audio application, offering the essential EQ features you need for either straightforward spectral balancing or enhancing particular sonic..
Alto Professional AEQ 215 Stereo 15-Band Graphic EQUltra-Low-Noise Frequency Control for Any Pro Audio ApplicationWith AEQ215 you get precise and reliable sound-shaping control. 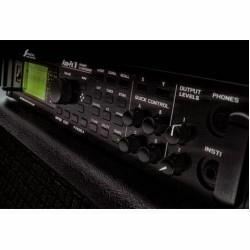 It’s built to last and perfect for any pro audio application, offering the essential EQ features you need for either strai..
Alesis MidiVerb4 Multi-effects ProcessorAlesis Midiverb 4 was a big hit with cost-conscious studio musicians when it was first launched back in the mid '80s. Now PAUL WHITE assesses whether the Midiverb 4 is still first among sequels.With so much of Alesis' R&D effort going into ADAT, it.. Processors Alto Professional HPA-6 6-ChannelHPA6 is a universal, multi-purpose mixer and headphoneamplifier for rehearsal, studio, or stage. Perfect for headphones, in-earmonitors, or personal monitor mixing, HPA6 features six independent high-powerstereo amplifiers in one compact rack unit that del..
New-generation SPX with 24-bit 96-kHz Processing and Advanced REV-X Reverb AlgorithmsFor more than 15 years the letters "SPX" have been synonymous with professional multi-effect processors, and over that time you would almost always find an SPX90, SPX90II, SPX900, SPX1000 or SPX990 in any well-equip..
Lexicon MX400 4-in/4-out Reverb/Effects Processor with USBPlug-in programming and recall with the power of Lexicon hardware.You want the rich, luscious sound that’s defined studio reverb for three decades: a genuine Lexicon hardware processor. But you also want the flexibility of programming high-qu..
DBX 2231 Graphic Equalizer/LimiterIt's amazing. One little button. It has so much effect. The Type III® Noise Reduction is an entirely new concept... virtually instantaneous encode/decode within the circuitry of the box. We started out to build the finest EQ's possible, boxes with the heritage and p..
Kompressor Alto ACOM2 2 ChannelAlto ACOM2 adalah kompresor / limiter memberikan Anda kontrol level yang jelas untuk aplikasi pro audio lainnya. Berkat dua independent, full-featured compressor/limiters, Anda bisa menggunakan ACOM2 sebagai two individual mono processor untuk memberikan true-ste..
DriveRack PX Powered Speaker OptimizerPowered speakers are a beautiful thing. Everything you need bundled into one simple, tidy, portable package. Just grab ‘em and go, right? Well, you may think your powered speaker system is complete, but you’re missing half the picture. DriveRack PX is the other ..
Focusrite Liquid Saffire 56 Audio Interface..
Suntec RDB-1 Direct BoxSuntec RDB 1 is an ultra-rugged Direct Box for performers in large venues. RDB-1 accepts a wide range of unbalanced signals, and processes these signals to be fed safely to Mixers - making the RDB-1 one of the most essential tools in any live performance! Protect your system, ..
DBX 120A Subharmonic SynthesizerWhy just rock the house when you can rattle the foundation loose. The wildy popular beat of "House Music" is likely to be driven by the throbbing, low-end bass of dbx® Subharmonic Synthesizers in clubs around the world. For decades, the patented dbx Subharmonic Synthe..
DBX 1066 Compressor / Limiter / GateAfter producing the world's most renown series of compressors, the task of producing a new compressor worthy of our reputation would be daunting for most engineers. Not for dbx®. Our engineers know audio like no one else in the world. Now the fruits of their talen..
DBX 1046 Quad Compressor / LimiterIn today's recording and sound reinforcement environments, the need for multiple channels of high quality, easy to use compression is growing rapidly. The new dbx® 1046 is designed to provide the audio professional with just that: 4 channels of great sounding dbx co..
DBX GoRack Performance ProcessorFeatures :Compact Form FactorAnti-Feedback Processing based on the dbx AFS™ (Advanced Feedback Suppression) algorithmdbx Compression (based on the dbx 163)Subharmonic SynthesisEQ (16 Musical Genre-Based 31-Band Graphic EQ Settings)Dual dbx Microphone Preamp/Line Input..
MX300 Stereo Reverb/Effects Processor with USBOur revolutionary MX200 and MX400 changed everything. The great sound of a hardware Lexicon reverb — plus the ability to put that power to work as part of your DAW workflow via PC VST® and Mac® AU plug-ins (32-bit only). Now we’ve packed a significant po..
Lexicon MX200 Stereo Reverb/Effects Processor with USBWhether you're looking for raw processing power with instant front-panel access for live performance, or seeking rich, smooth and complex processing algorithms in the studio, Lexicon® brings the best of both worlds together in the MX200 Dual Reve..
DBX 231s Dual Channel 31-Band EqualizerExceptional sound and rugged reliabilityWhen the pros need an EQ, they turn to dbx. With a proven track record that spans four decades, dbx® EQs are the industry standard for touring, studios, and audio installations. With the dbx heritage of revered pro EQs, t..
PreSonus AudioBox 1818VSLA professional recording system you can grow with.When you’re recording a full band, you need an interface with enough I/O to handle the challenge. For these sessions, the AudioBox 1818VSL USB 2.0 audio/MIDI interface has you covered with six mic/line inputs and two mic/inst..